Mike Kolberg, owner of Royal Moving & Storage, approached SageTea with a business challenge. Royal Moving & Storage warehouses were being managed by a manual process, run by an experienced yet steadily aging workforce. It was clear that new technology would be needed to ensure consistent warehouse processes with continued growth and inevitable employee turnover. In addition, Royal Moving & Storage could see a competitive advantage to be gained from integrating the latest technology into both its storage and transportation businesses. Mr. Kolberg was keen to capitalize the team’s corporate knowledge of warehouse operations, developing it into repeatable processes by automating and standardizing warehouse management procedures. Cost and time to market for their highly customized software needs would be factors in their decision about how to implement these changes. David Long, founder of SageTea, interviewed Mr. Kolberg and his staff to define the system requirements. From this, SageTea developed a document, incorporating Royal Moving’s warehouse management knowledge, defining what Royal needed and expected from their new system. SageTea then imported this document into the Text to Software® tool. The Text to Software platform was so fast that SageTea used it to show Mike what his future system would look like prior to signing a contract with Sage Tea. This unique feature is vastly superior to the typical business card and brochure approach that traditional software vendors offer. Text to Software transformed the many years of hard earned experience from the original text into a new SageTea application – designed for Royal Moving & Storage. Because Text to Software generates code directly from text, SageTea was able to respond to both a change of size and configuration of the warehouse (as well as its actual location) during the software development process by simply revising the descriptive text documents and regenerating the software. SageTea delivered the application within the original budget, even with the changes. SageTea’s significant savings in both cost and development time when compared to traditional vendors really impressed Royal Moving & Storage. The resulting application was installed in one day and, because it accurately reflected already existing processes, employee training and acceptance was almost instantaneous. A second phase is underway which will include integrating the management of all Royal’s warehouses as well as its fleet of short and long haul trucks. Royal Moving & Storage is a proud member of Atlas Van Lines. The company began as a small local moving company in 1983. It has grown to include a Cross-Border Operations Department and a Door-to-Door Overseas Division that today can service virtually any city in the world. The company has over 50 employees, with an average length of service of 15 years. The facilities include an on-site truck scale and 56,000 square feet of Government approved Canada Customs bonded warehouse space. Their warehouses are fully palletized, sprinklered, alarmed and monitored. 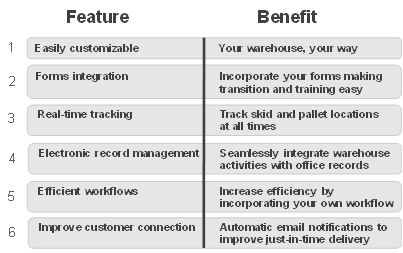 SageTea Warehouse Management’s value is its PRICE. It is significantly less expensive to buy and install.